This is a great venue for an open water swim. The event is open to swimmers of all ages and ability. Appropriate open water training and race day preparation is recommended. Encourage your friends to come out and enjoy a healthy way to participate, and donate! Pace yourself on the course and rest as required, but please respect the 2 hour race cut-off. Competitive swimmers and triathletes can use this as an excellent training session for upcoming races. Free parking is available at Nepean Sailing Club. Please encourage your friends and family to utilize our bus service from Nepean Sailing Club to Britannia Yacht club and back to Nepean Sailing Club starting at 8:00am. With more parking available at NSC, consider using the shuttle to help reduce parking congestion at BYC and their neighborhood! The Nepean Sailing Club will be hosting a post swim breakfast for swimmers, friends, family and teammates. Visit here for more information approaching the swim date. The Bring on the Bay swim event is part of the Global Swim Series (GSS). Start time and swim rules: The 3K swim starts at 8:00 am sharp at the Nepean Sailing Club. BOTB will use a combination of a small ‘in-the-water’ start, and a rolling wave start system to get all swimmers into the water. Swim caps must be worn during the race and are included with your registration package. There are no restrictions on wetsuits. Of course, there will be sailboats, powerboats, canoes and kayaks patrolling the course (see map), along with the Ottawa Fire Rescue zodiac to keep the event as safe as possible. Elite Start: Will be available for swimmers meeting a minimum qualifying predicted finish time, and at the discretion of the race organization team. There will be a small in-water start for this group. There will be approximately 50 Elite swimmers of all categories (male, female, and with wetsuits), that will be starting by touching the dock. All swimmers will provide a predicted finish time, and grouped into waves at registration with coloured swimming caps. Starting on the boat ramp area, each group of swimmers will be marshalled onto the dock, walk to the end of the dock. Here they will cross a start timing mat located at the end of the dock to begin the timing of their swim. Seeding yourself within your wave will ensure minimal congestion in the water. Additional guidance will be provided at race kit pickup. Water conditions: The water temperature in July is typically in the mid-20s C. “Like” our Facebook page, and get updates on the water conditions, and information on your position in the rolling starts, as the event draws near. Cancellation of the event: We have been fortunate with the weather for this swim event to date. However, in the unlikely case of severe weather (lightning, low visibility, strong northwest winds and resulting high waves), the swim will be canceled. No refunds will be issued; however, we may be able to issue you a tax receipt for your donation. We have not had to cancel a Bring on the Bay swim event in the past. Once you’ve climbed up the bright red ladders at the Britannia Yacht Club, take a well deserved break, and cheer in the rest of the swimmers. 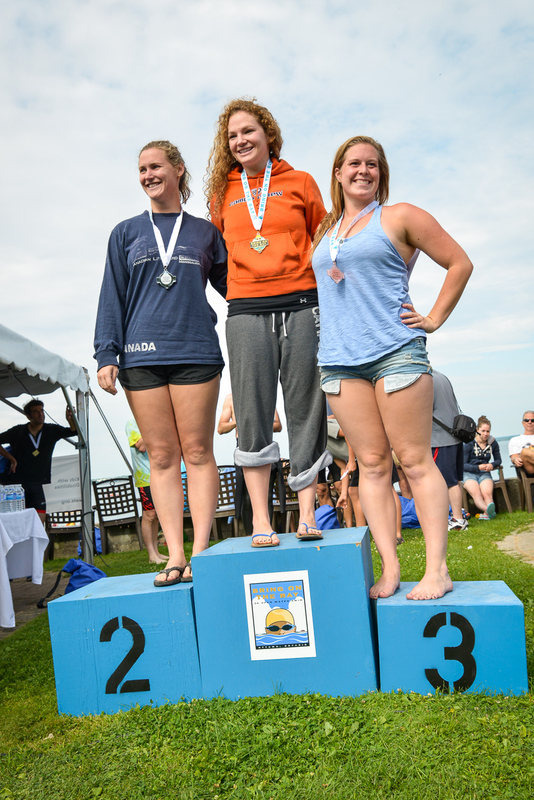 You will receive your well deserved BOTB swim medal on the pier! There will be post race snacks provided, and your tagged gear will be transported over from the Nepean Sailing Club, and organized by our volunteers for pickup. If friends and family are joining you at BYC, please ensure they respect the parking signs and marshals to keep traffic moving at the club. Awards: All swimmers will receive finishing medals. Awards and prizes will be presented, starting at approximately 9:45am to the overall top-3 swim (wetsuit/non-wetsuit), for male and female swimmers. Prize categories for the top three age-group swimmers (wetsuit/non-wetsuit), in each male and female age-group category, as of race day: F14 and under, M14 and under, M15-19, F15-19, F20-29, M20-29, F30-39, M30-39, F40-49, M40-49, F50-59, M50-59, F60-69, M60-69, and M70+, F70+ and over. Race results provided by Sportstats. Thank you for supporting Ottawa’s Easter Seals Kids!